This comic was posted in Q2Q and tagged Comics, Costumes, Director, La Ropasucia, q2q comics, Tech Theatre, Theatre, Webcomics, Wigs. 5th Annual Q2Q Comics Costume Contest! It’s October, so of course we’re doing the costume contest again! 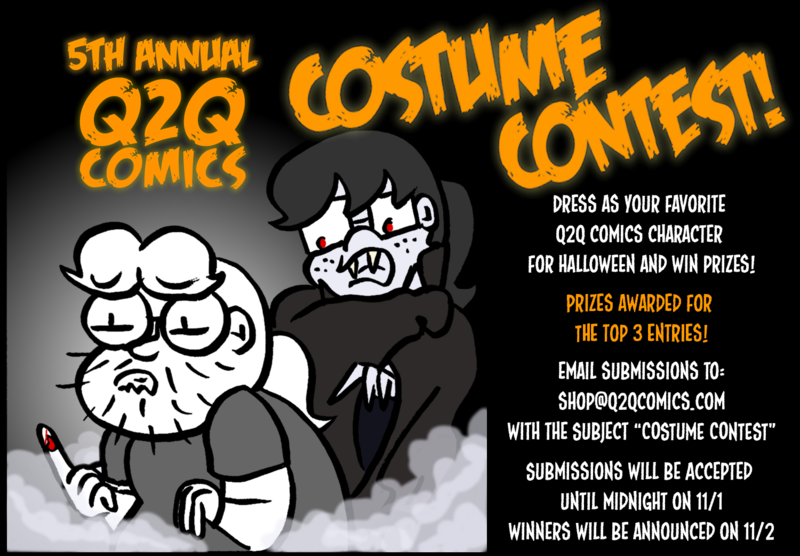 Submit photographic proof of you dressed as your favorite Q2Q Comics character for Halloween and you can win fabulous prizes! Creativity, effort, and attention to detail will all help you earn points. You can enter by yourself, with a friend, or as a whole danged group if you want. Top prizes this year include original art from a comic including your favorite character, a signed and doodled copy of Q2Q Comics Volume 1, and signed prints! Send your entries to shop@q2qcomics.com with “Costume Contest” in the subject line by midnight on 11/1 to enter. I’ll announce the winners on 11/2.